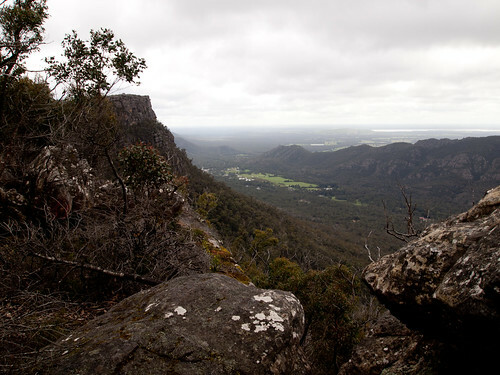 On our previous trip to the Grampians we had been so enchanted we decided to return. It was a last-minute decision and I wasn’t sure we would even find a place to stay since the school holidays have kicked in. In Australia, you are considered somewhat mad to go anyplace that might be attractive to children during the school holidays. 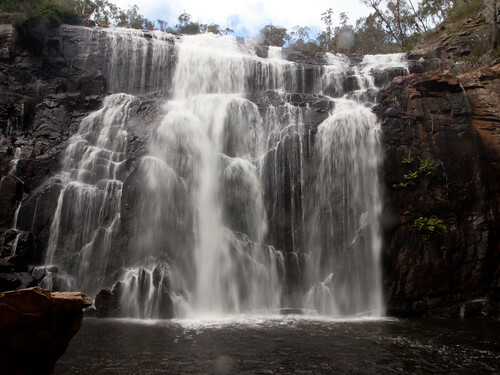 The Grampians offer campgrounds, cockatoos and kangaroos, challenging hiking trails and overlooks, beautiful waterfalls and a zoo, so it falls into the category of child magnet. Despite the odds we did find a place to stay and I was even able to secure a Victorian Seniors discount. Our new abode was at least three degrees fancier than our previous accommodation, which was little more than a large trailer with amenities. This place had a working wood stove and a DVD player as well as a Queen-size bed, a full kitchen and bath. Even though it was a log cabin, the cabin was roomy and light. Outside, a ten meter stroll toward Fyans creek and you were in the middle of a mob of kangaroos. 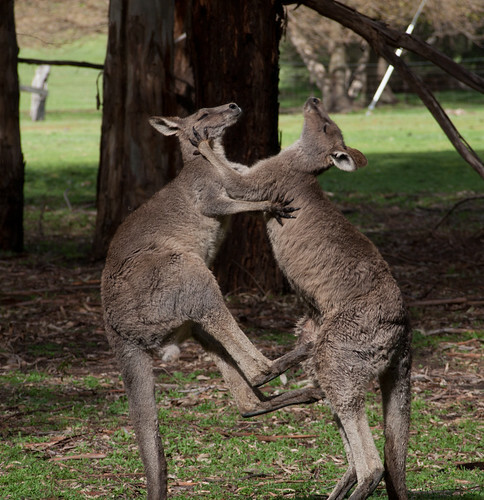 A couple of youngsters were sparring, an activity I have never witnessed before. We packed a dinner to heat up in the cabin rather than attempting to make a reservation at one of the restaurants in Halls Gap during school holidays. On the drive up, I was once again struck by the alarming signs indicating a nation of narcolepts. “A micro sleep can kill in a micro second,” said one. “Don’t sleep and drive,” said another, which seems a little too prosaic for signage. Most of them urged drivers to pull over and have a “power nap.” Not one mentions the Dreaming, but the ubiquity of the signs do make you wonder about the state of your fellow drivers. How far gone are they, a mere microsecond away from oblivion? You can never reproduce the magic of seeing a place for the first time, but we did do some things we missed on the last trip. We walked down the steep staircase that leads to the bottom of Mackenzie Falls, hiked the trail to the look-off over Lake Bellfield, followed the loop walk along Fyans Creek and revisited the Botanical Garden, an oasis of peace even during school holidays. Most of the trails in the Park are simply too difficult for someone like my wife, with no depth perception and little ability to deal with high contrast, but the enchantment of the Grampians lies above and beyond spectacular views at the end of a tricky trail. Check out the photos by clicking on one of the pics running alongside this post, or plug in http://www.flickr.com/photos/jhalbrook/sets/72157630924994030. 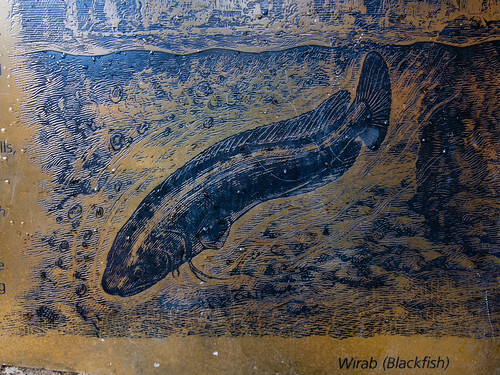 All the best pics are on Flickr, user name Red Flier, the Grampians set.